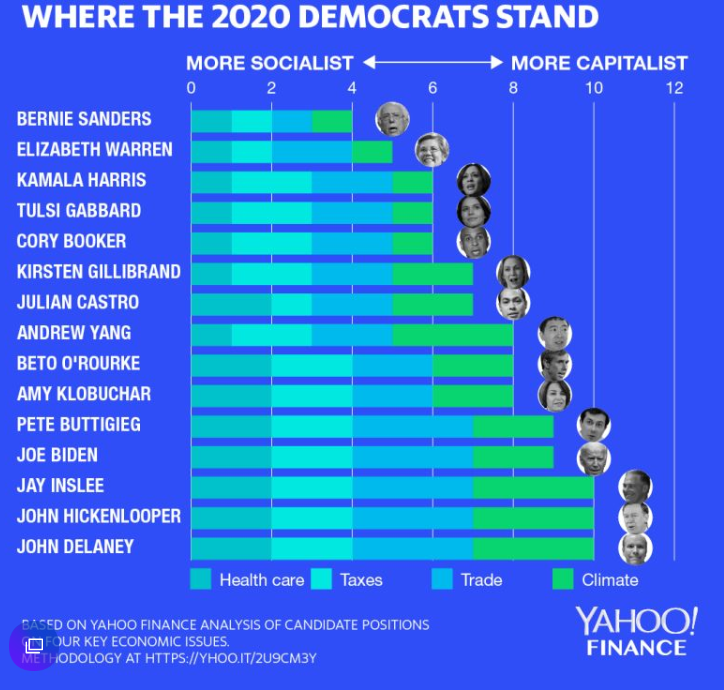 Yahoo Finance has put together a nice chart of the socialistic and capitalistic tendencies of the various Democrats running for president. It is a pretty pathetic group. The scale is 1 to 12. I think they got the ranking, from bad to worse, right but I wouldn't have given any of them a total ranking of even 6, the half-way point. Here's the complete Yahoo methodology. Delaney doesn’t favor a “Medicare for all” system that would put the government in charge of everybody’s health care, he backs basic government coverage for everybody, with traditional insurers offering supplemental coverage for people who want more, and are willing to pay for it themselves. Money for this program would come from eliminating the tax breaks for employer-provided insurance and other subsidies, eliminating the Affordable Care Act (which would no longer be needed) and improving Medicaid. Above certain income levels, patients would be responsible for co-pays. Delaney doesn’t want to soak the rich with new taxes, the way Elizabeth Warren’s “wealth tax” might, or a 70% marginal tax rate would. But he’d raise some taxes modestly, to generate funds for other programs. He’d raise the corporate tax rate from 21% to 25% and use the added revenue to finance more infrastructure spending. He’d raise the top income tax rate from 37% to 39.6%, which is what it was before the Trump tax cuts of 2017 lowered it. He’d also push the capital-gains tax higher for short-term investments, so that the tax on investment income is comparable to the tax on labor income. Trump to the right of me, Democrats to the left of me. We are doomed. Kind of want to see a Biden/Trump election. Two Buffoons running against each other. And if Biden wins, at least he's no Bernie Sanders.